Don’t get stuck in a hairy situation! Wear less and go hairless! 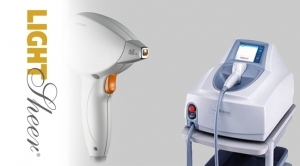 Laser Hair Removal devices are not all the same. The Lumenis LightSheer is a true diode laser unlike many less expensive and less effective devices. Lumenis Lightsheer treatments are done on a cyclical basis as hair follicles exist in different stages that are sometimes not in phase to destroy the follicle’s base. For this reason hair removal requires multiple treatments at strategic periods to effectively make an area ‘clean’. Learn even more about our hair removal services.